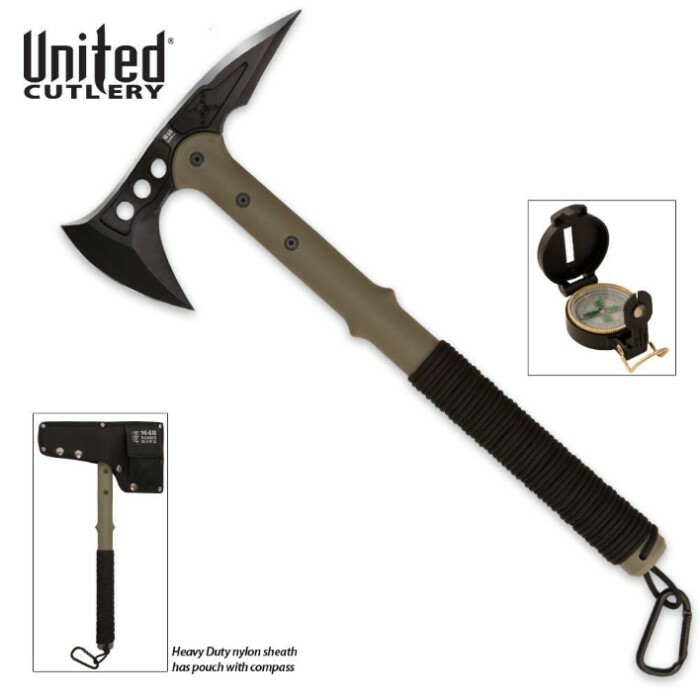 Military Ranger edition of our Advanced Combat Tactical Tomahawk, with dark handle, cord wrapping, and compass companion. The 8 in. anodized AUS-6 stainless steel blade is securely attached to the virtually indestructible 30% Fiberglass reinforced nylon handle with three separate bolts. It comes complete with a nylon snap-button sheath. It is 15 in. overall. Good for what it is, this is not a heavy duty Tomahawk, the handle is not as heavy as it could be...the Compass is just a little toy that I had to give my grand daughter, the bezel is in a fixed position so you cant put in any declination, the compass it self only works when it wants to, and because it is such a light weight plastic, I would recommend getting a real Lensatic Compass, old military issue. this tomahawk is a very sturdy solid weapon. I have used this for a week, throwing and cutting down trees and its still in amazing condition. one thing is that the compass wasn't as great as some other ones I've seen but it still works. over all I'm glad i bought this weapon and would gladly buy from this site again. I ordered two of these, one was a gift, the M48 Marine version. A week after I received them, the price dropped, a week after that it dropped again! Damn the luck! Aside from that, this is an AWESOME tomahawk! Well worth the money, very well balanced, very sharp, and very well made! The only modification I will be making will be to the paracord wrapped handle. It tends to loosen up with use and if not adressed could become a hazard. This gets an easy 4-5 stars! It was actually a very great decently balance tomahawk buuuut after around 50 throws or so the handle broke where the metal starts. It was a huge disappointment. I would understand it to be a lower price, but that's too expensive for 50 throws. I collect tomahawks.I bought this one so I didn't have to read about it anymore.Not my first hawk.Better than some,not better than others.You should only throw throwing hawks.This is not one of them folks.My Vietnam hawk has way better punching power through metal.I do like the cutting edge.I carry different hawks for various things,This one will sit by my bed.Cold steel has some good hawks as does other companies.I like a hammer backs with a good blade its way more practical in the woods.Im not going into combat and am not killing zombies.Sorry fellas not my thing.Just a collector and avid woodsmen.Enjoy it for what it is.It is worth the money.For the ones that broke go get a round wood mal handle,cut the length you want table saw the proper length drill the holes and your back to work.It will not break when you throw it.Thats the problem with the plastic handles,vibration kills them.Edged weapons are cool!Go getem boys!Late! This thing is sweet. Like the FDE mine came in. With a little play I bet one could fit it on some M.O.L.L.E. gear. Razer sharp ax head and the spike has no problem punching holes in just about anything. Has a solid feel to it. Could use an upgraded compass. As is though the M48 Ranger Hawk is war ready. Great tool compass is poor but I upgraded for the mollie comp. pouch. I've had it for about 6 months, been using this alot but haven't really abused it. I rarely give 5 stars but I think this tomahawk has erned it. This axe is excellent! It's sturdy, sharp, and appealing to the eye. The compass is useful, but the materials used to make it could be higher quality, like maybe a metal body instead of plastic. 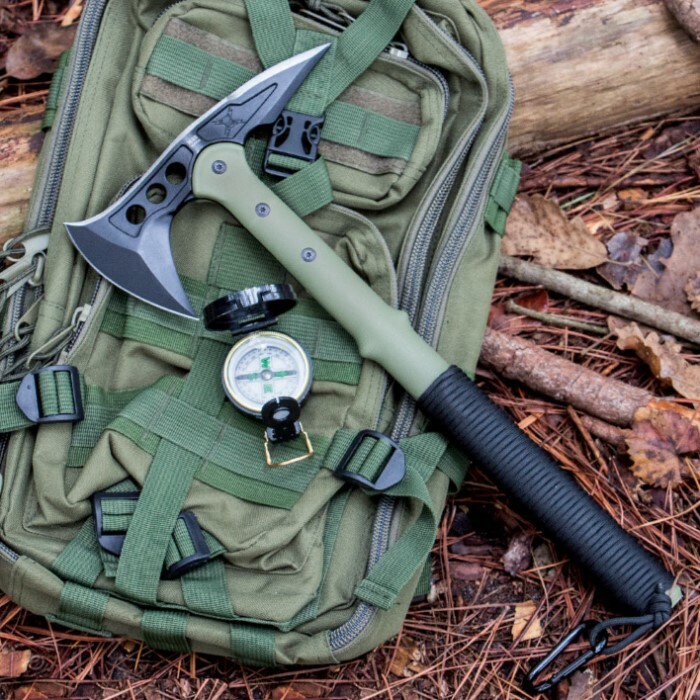 If you're buying this just for the axe/compass combo, it's probably not worth the extra $10. However, if you're buying it because you also like the color, which is slightly more green than in the image, then it's worth it. My one real complaint that gave this a 4 star rating is something that I suspect is just a rare case. Upon examination of the spike on the back of the axe head, it appears as though the very tip of it might have been previously chipped off and sanded down to a slightly uneven surface, dulling said tip making it not as effective in piercing. As I said before though, I believe this is just my rare experience. If it weren't for this chip, I'd have given this axe a 5 star rating in a heartbeat. 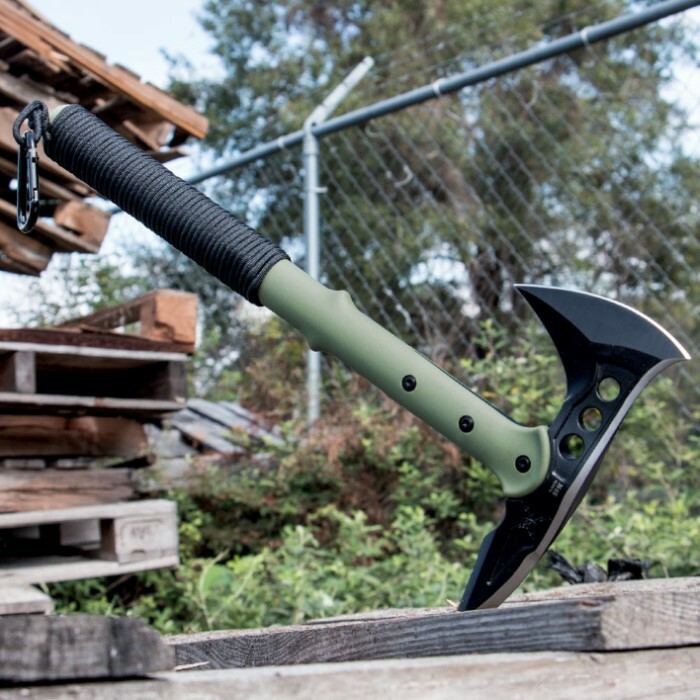 It's a very good axe otherwise, and I still highly recommend the M48 Tactical Tomahawk in general to everyone. This is a nice piece especially for the price. It has a good balance and 2 good weapons w/nice sharp edges. Also has a Gr8 look to it which is good because i hope that's the only the thing it gets used for, if i have to actually use the weapon its gonna be a real bad day,lol.